What could be better than homemade chocolate ice cream? 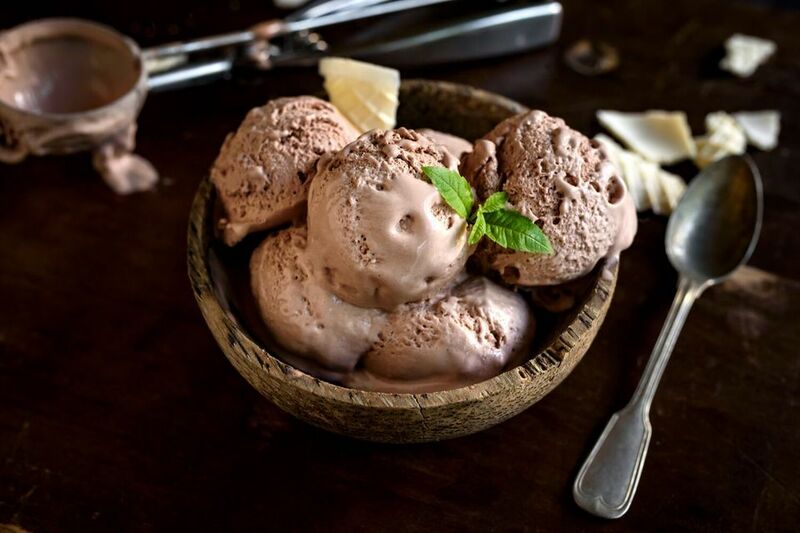 How about homemade chocolate ice cream that only has five basic ingredients and can be put together in just a few minutes? An easy chocolate ice cream recipe should be a staple for anyone interested in making homemade frozen desserts. This recipe is great served as-is, but there are tons of mix-ins that you can add to increase the flavor. Fold in a ribbon of chocolate syrup after the ice cream is frozen, add a handful of chocolate chips, or even add a few roughly chopped chocolate sandwich cookies. Double up the chocolate goodness. Whisk together milk, cocoa powder, and sugar to combine. The sugar and cocoa should close to completely dissolve. Refrigerate the chocolate ice cream base for at least 30 minutes before putting it in your ice cream freezer, so it is completely cold. This will help it freeze faster, improving the texture, and allow the cocoa powder to become fully hydrated by the milk and cream. Give the ice cream base one more gentle stir and freeze according to the directions of your ice cream freezer. Store your ice cream in an air-tight plastic container in the back of the freezer. This will help preserve the flavor and texture of the finished ice cream. The key to great chocolate ice cream is buying good cocoa powder. If you have had a container of cocoa sitting in your cupboard, open, for months on end, get rid of it and buy something new. The cocoa powder loses its potency over time. You can tell if it is getting older because the color will start to fade from the deep chocolate hue it had to start. There are lots of high-end brands that make good cocoa. Check for Ghirardelli cocoa powder at your grocery store. You can serve this easy chocolate ice cream recipe right from the ice cream freezer, but it will have the texture of soft-serve. Freezing for an hour before serving will give you a firmer texture if you can wait that long. It’s just as delicious either way, so go with what you prefer best. Although the recipe calls for whole milk, you can use whatever you have on hand. I’ve put together this recipe with 1 percent milk on several occasions and it always turns out great. Keep it simple and try not to buy too many ingredients that your family won’t use otherwise. Chocolate, vanilla, and strawberry ice cream are three great basic flavors to master. Once you have a good recipe for each available, you can start getting creative by changing things up. For example, try adding a teaspoon of instant coffee or espresso powder to this easy chocolate ice cream. You will get a great mocha flavor without taking any more time putting the recipe together.